On the February 15th Y-PLAN Site Mapping and Inspiration Tour for Skyline High School, Kristina Hill, a UC Berkeley professor and landscape architect representing the All Bay Collective (ABC) Team for the Resilient by Design | Bay Area Challenge, posed a question of great relevance to today’s urban environment and to the teenagers in attendance. This question was posed to guide an analytical investigation of their San Leandro Bay site. What seems natural and what seems artificial? Getting off the buses on an informal drop-off zone in between the 580 and the San Leandro Bay, students surrounded Hill as she shared 3 ABC Team core proposal ideas of Tidal Cities, Resilient Corridors, and Resilient Equity Hubs, and how they would affect the high pollution zone around them. The 580 creates a serious health problem to the residential neighborhoods nearby and to the park. Furthermore, she asked students to think about the accessibility to resources and natural barriers present to get to the park. There were no bike lanes or bus routes that led directly to it. She proposed one solution to reduce the negative impacts of the highway: burying it underground. Hill then discussed the issue with the Coliseum only a few miles away from the park. It had become an obsolete icon that would cost city residents millions of dollars, yet still be demolished for the construction of a new facility. Students were baffled by the accumulation of debt the city would endure to preserve their historical and identity icons. Furthermore, Hill shared a solution her team was proposing in place of the replacement Coliseum: a floating housing complex that would adapt to the changing environmental conditions in the area. She explained to the students how this proposal would also attempt to address the risks of groundwater rising in flatland neighborhoods that are not adjacent to the waterfront. Before entering the parking lot, students, with the help of the staff, had to cross the street in clusters, as there was no cross walk in the vicinity. This was challenging, as cars would not slow down for the crowd, nor were they patient. Students again had to reconsider accessibility as an obstacle, not only for them, but for their communities. If they, as an agile group of teenagers, struggled to cross a busy street, what would their younger siblings do? How would elderly or handicapped people cross at all? The clusters became groups and walked through the park with those question in mind. Many students asked about the smell of the environment and why it required fencing. Some students argued that the fences were obviously artificial and the paths were too. They noticed birds everywhere and some students realized there was a bird consortium. Students arrived at the San Leandro Bay site to find what seemed like an observation deck of the “natural” ponds. The observation deck had wooden ergonomic benches with the complementary wooden dock. It was in this location that Hill discussed with the students the development project for the area. The wetlands that surrounded the observation deck were created from a man-made accident that resulted in the compilation of the soil that eventually resulted in the wetland. Although the soil becomes a natural barrier in the event of high tidal waves, it does not provide the containment necessary for inevitable sea level rise. Without containment, the layers of pollution that have been contained will be released and clean ground water will be contaminated. Hill then stated that it is necessary to search for solutions, such as floating housing that can adapt, to change with the environment when we cannot contain it. To avoid expensive solutions when the problem cannot be avoided, implementation of more inexpensive solutions must begin. It is why the underground highway becomes a solution that will avoid the expensive strategy of base isolation. Students continued to explore their site and found a variety of ecosystems present by the wetlands. Wild plants and flowers created a pleasant and unexpected environment. 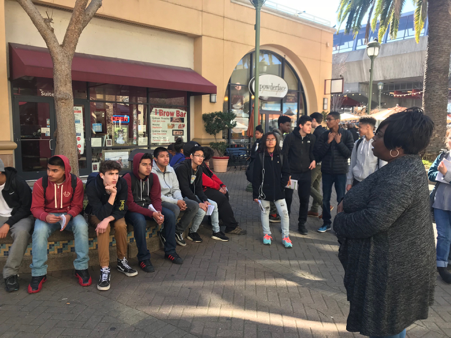 After leaving San Leandro Bay, the students thanked Kristina for her guidance, and moved on to visit the Fruitvale BART Station Village. 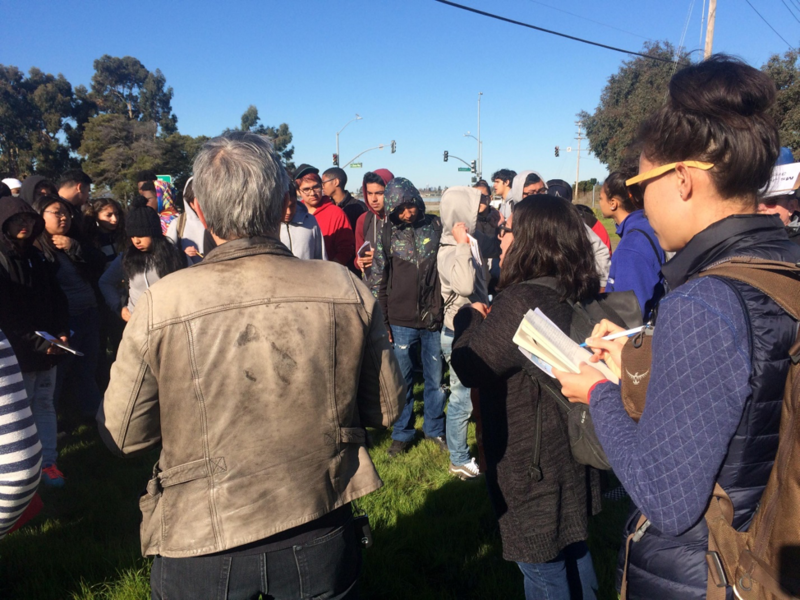 In Fruitvale, students learned about affordable housing and the neighborhood services and amenities that are also at risk due to the potential impacts of climate change and sea level rise. It was here that students were able to consider the effects of the natural world on the people of Oakland. If sea level rise claims part of their city’s land, who will suffer first? Whose lives will be most altered by climate change and sea level rise? Are those impacts equally felt across all people, or disproportionately by those with less money and resources? 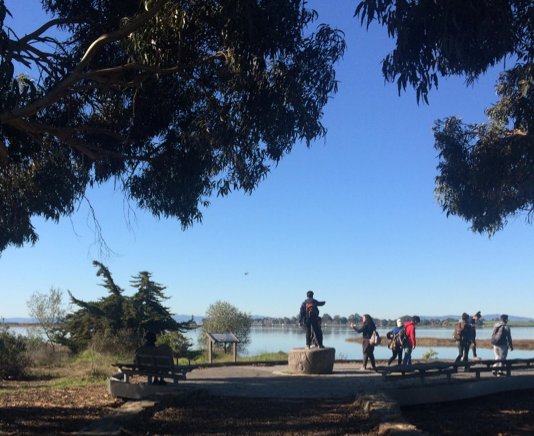 From there, the students enjoyed lunch at the Middle Harbor Shoreline Park, a beautiful public green space near the Oakland Port that many students had never before visited. 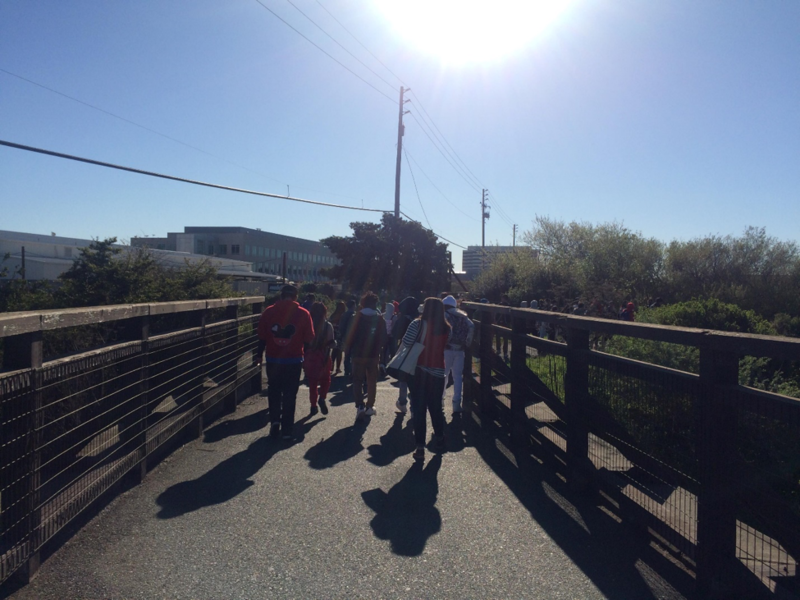 Their final stop brought them to the Bay Bridge Landing, where students heard directly from the City of Oakland’s Sustainability Department about the vision and goals of the City to make this entrance to Oakland a green, public, and resilient space. Armed with their own site mapping and observations, and with the information presented and questions raised by representatives of the Resilient by Design | Bay Area Challenge and by leaders of the City of Oakland, students returned to Skyline High School prepared to continue their Y-PLAN process. Their next steps are to complete a SWOT (Strength – Weakness – Opportunity – Threat) analysis and to design and conduct surveys and interviews.